Mums are amazing. After moaning at my mum and mentioning that I had now resorted to washing my hair with bicarbonate of soda, she found a new sensitive skin product for me to try. She'd mentioned my plight to her hairdresser, or the girl who does her nails, and she had suggested that I try Arbonne Baby Care (ABC). They sold it there at the hairdressers but apparently people had been coming back again and again to buy it for their babies and it had even cleared up baby eczema and cradle cap. So she bought me a bottle of the Arbonne Baby Care shampoo and wash to try. After all, if it was safe for new born babies it must be really gentle? I used it the very next day to wash my hair with and as a shower gel. It seemed lovely! It smelt really nice (not like some of the medicinal smelling shampoos I'd been using recently) and lathered up really well. An enjoyable shower experience for a change. It made my hair really nice and didn't irritate my skin at all. I reported back to Mum and she promptly went out and bought more of the ABC wash as well as an Arbonne Baby Care moisturiser and skin oil (at great expense as they're all about £10 a bottle.) You can't buy it in most shops or online, you have to buy it direct from an agent like you used to have to do with Avon. I'll report back on the skin products another time but I'll let you know how I got on with the Arbonne shampoo and wash after more prolonged use. 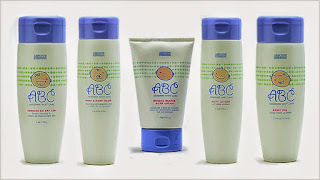 I would say that used as a shower gel, the Arbonne Baby Care wash is great and did not seem to irritate my skin any more than a plain shower with just water does, and it's really lovely to use. It is expensive though. However the shampoo does not clear my cradle cap. The first day I use it my scalp seems fine but as the day goes on or by day 2, the scalp build up is back :( It's tempting to carry on using it as a shampoo though as I like it so much, and it least it doesn't make my head really itchy like some shampoo.